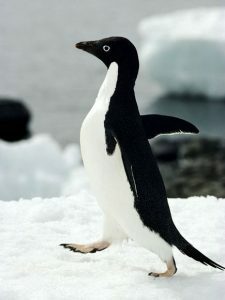 Adelie penguins were discovered in 1840 by two scientists, Hombron and Jacquinot, who were part of an Antarctic research team. 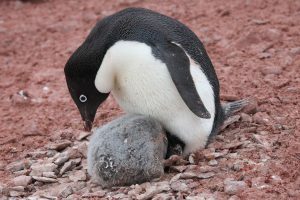 They are named after the Adelie Land island where they were first sighted, which in turn was named after the wife of the French explorer Jules Dumont d’Urville, who led the expedition. 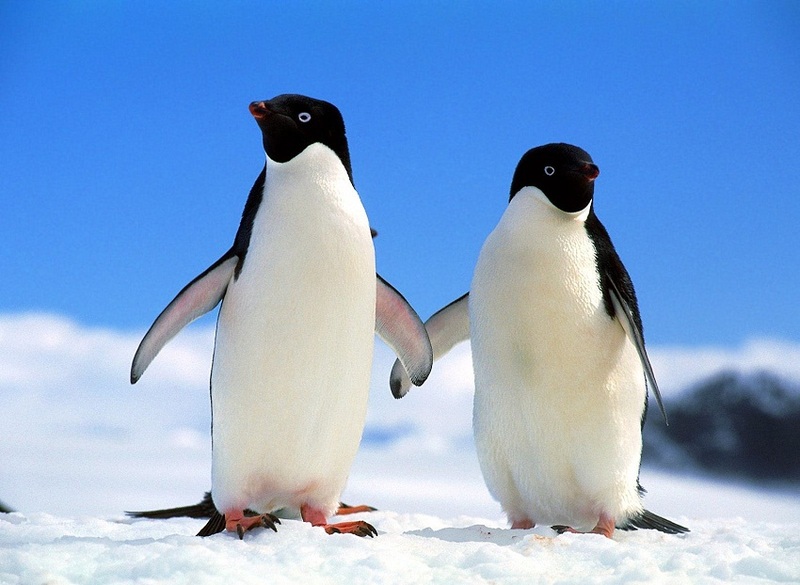 Size: It is a medium sized penguin that grows to a height of approximately 70cm. Males and females are of a similar size and difficult to tell apart. Weight:They generally weigh around 3-6kgs. Feathers: The feathers on the back of their head and at the base of their bill are slightly elongated and can be raised to form a small crest. In fact these long feathers end up hiding most of their red bill. Feet: Theyhave webbed white feet which turns pink when they walk or swim. 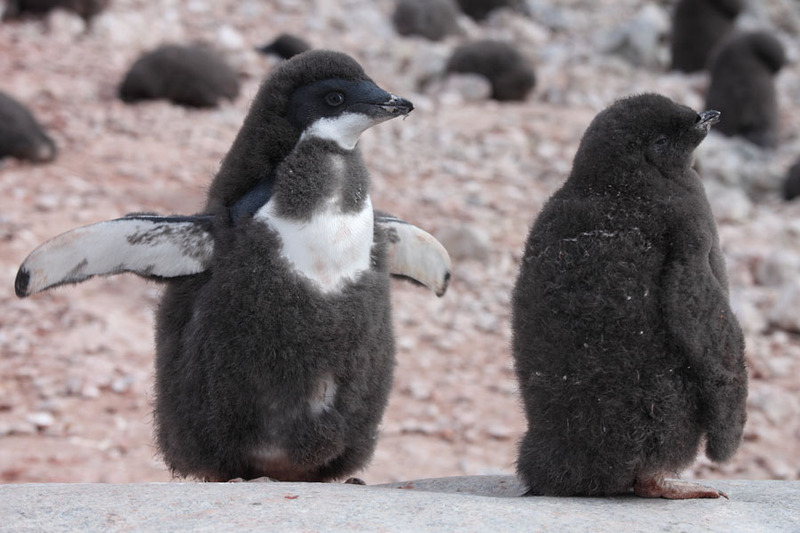 Tail: The tip of their tails are also larger compared to other penguins and gives them a tuxedo like appearance. Color: Light colored individuals are also known to occur in certain colonies, though they are rare. Younger immature birds of up to 14 months of age differ from adults in having a white rather than black chin; also they lack the characteristic white ring around their eyes. They are one among the only five species of penguins (Adelie, Emperor, Gentoo, Chinstrap and Maccaroni Penguins) that are found in the Antarctic continent and are categorized among the most southerly distributed seabirds. 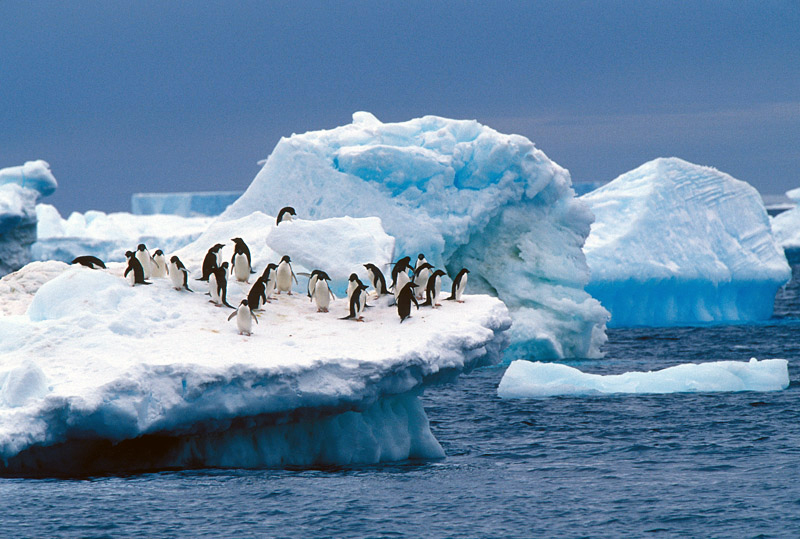 It is estimated that roughly 2.8 million breeding pairs are distributed along the Antarctic coast. During their breeding months they are generally found along the shores of South Shetland, South Orkney, South Sandwich and Bouvetoya Islands. These birds often dwell in closely packed rookeries on ice free slopes and islands often far from open water. 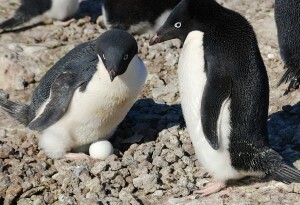 Their nests, usually depressions on the ground, are aligned with small stones that protect the eggs from melting snow. Lack of an accessible nesting habitat has restricted the species to the high Antarctic. 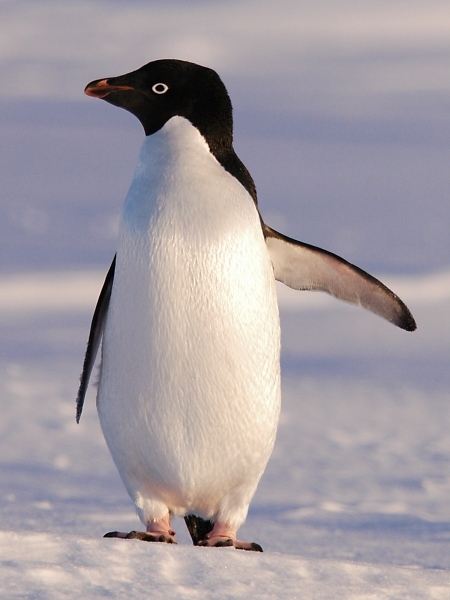 Adelie penguins are known to migrate about an average of 13,000kms in a year, from their breeding colonies to their winter feeding grounds (north of the Antarctic) and back again. Younglings are known to travel even further north than adults. Isolated sightings of the species have been recorded as far north as Georgia, Falkland Islands, Kerguelen and Tasmania. Their diet mainly constitutes fish, squid, amphipods and krill. By and large it differs according to the location from where the food is captured. 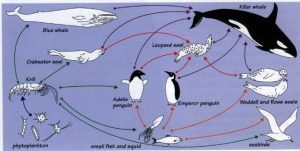 However, a recent abundance of krill (Crystal krill and Antarctic krill) in that region has made it a rather easier and preferable food source for the penguins. Feeding Habits: Adult birds travel up to 120km offshore in order to forage food for their chicks. A feeding trip can last anywhere between 5-72hrs in duration. Meal sizes vary between 300-650gm depending upon the size of the chick. They generally feed in the upper 70m of the water column. They are highly sociable birds that gather in large groups and colonies often extending up to several thousand individual penguins. Though they are not terribly territorial, adult males can get aggressive over nesting sites and have been known to attack their neighbors for stealing stones from them. They are also known to hunt in groups to mitigate the risk of being attacked by predators. Scientists have discovered that they constantly interact with one another using sounds, body language and certain specific eye movements. The adult penguins do not face much threat from land based predators due to the freezing conditions in which they inhabit. 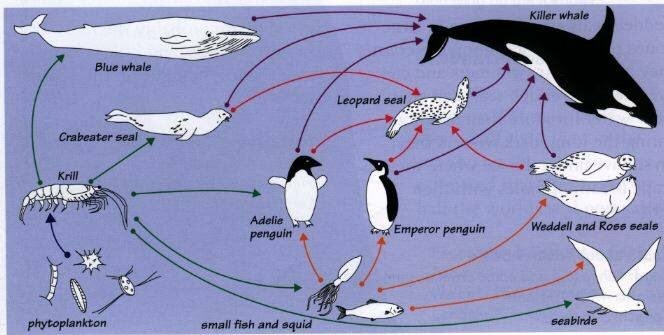 However, in water their most dominant predator is the leopard seal, which resides in the Southern Oceans. They are often attacked by orcas and blue whales as well. Polar Skuas are known to prey upon their eggs along with chicks that have strayed from the group. This particular species have shown a specialized adaptation to survive the cold and harsh conditions of the Antarctic region. Since these birds do not sweat, their circulatory system adjusts itself to conserve or release body heat to maintain body temperature. As mentioned earlier their feet are whitish, when they are dormant, which is due to a reduced blood flow. Upon exercising their feet, they turn pink as blood flows to that area and tries to expel the heat thus generated. They tuck in their flippers close to their bodies and may also shiver to generate additional heat. Adult penguins use their strong feet, toe nails and legs to push themselves as they slide along the ice on their belly. This is called ‘tobogganing’. During deep dives, these penguins can reduce their heart rate from 80 to 100 beats per minute (bpm) to about 20 bpm enabling them to stay underwater for up to 7 minutes at a time. They experience a brief mating season from October to November i.e. from the end of winter to the beginning of spring. 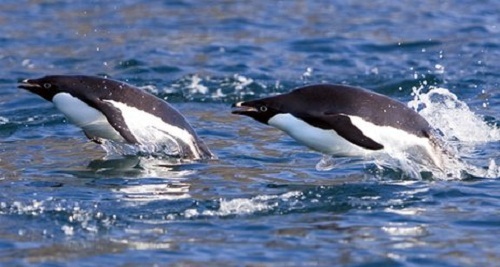 The reproductive cycle of this species is highly synchronized with the Antarctic summer (October to April) in order to take advantage of the light sea ice and the peak in marine resources that occur at that time. These penguins mate for life, with females laying two eggs a couple of days apart, each weighing 100g to 125g. They take turns incubating the eggs and keeping them safe from predators. When not incubating the eggs, the females spend 15 to 20 days at sea, while the males spend 10 and 12 days at sea feeding and hunting. Sometimes only one of the two chicks may survive, due to a shortage of food. The young chicks have an egg-tooth, a bump on the top of their beaks, which helps them to break out of the egg. After about three weeks, parents are able to leave the chicks alone, who then gather in groups called crèches for protection and warmth. When the chicks are 7-9 weeks of age they develop their own feathers and are able to go out into the sea. They usually reach reproductive maturity in 3-6 years. They have a life span of 10 to 20 years. These birds are known to use sounds to attract mates, ward off predators, express displeasure at a neighbor and stay together as they swim. They also call out to locate their partners and chicks in the crowd. This species has been uplisted from “Least Concern” to “Near Threatened” because it is expected to undergo a moderately rapid population decline over the next few generations, owing to the effects of a projected climate change.